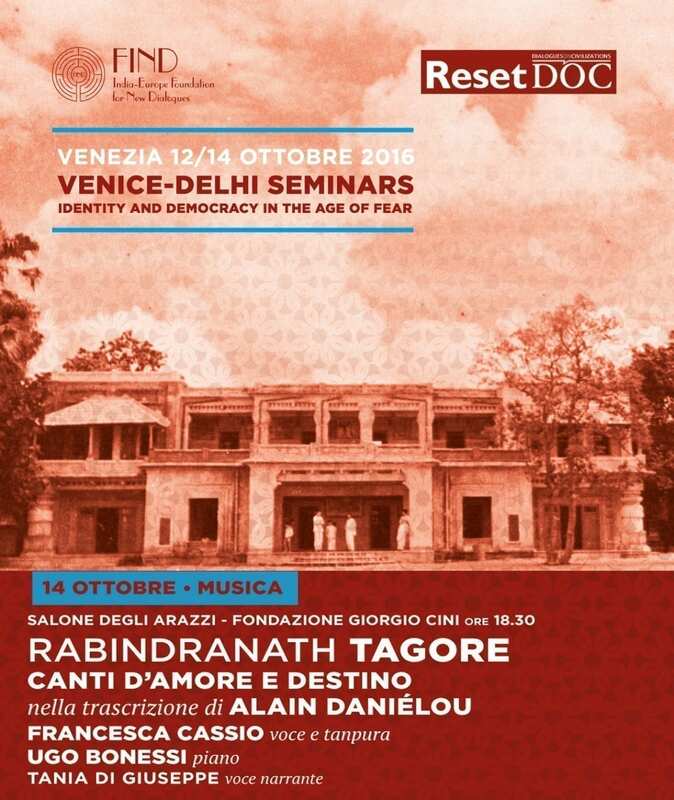 The transcription for voice and piano of some of Tagore’s songs is an original idea of the Poet himself who wished the Western audience to become more familiar with his opera and he found in the French musicologist Alain Daniélou his best interpreter. Rabindranath Tagore and Alain Daniélou met in 1932 in Shantiniketan, West Begal, and they had, right from the start, a deep mutual understanding and cultural affinities. It could be said that the meeting of Tagore and Daniélou, in music as in life, was indeed an encounter between East and West, in a double and reciprocal direction. Under the in influence of the great Poet, Alain Daniélou devoted his life to spreading Indian culture in all its aspects, both through his books, as also through teaching projects, such as the Intercultural Institutes of Comparative Music Studies in Berlin and Venice, where Indian music was taught to Westerners for the first time in Europe. Daniélou writes in the preface to the publication by Ricordi of Trois Melodies de Rabindranath Tagore: “It was in fact the Poet’s wish to make it possible for some of his songs to be sung also for a western audience. Given his ideas on the need to establish greater understanding between peoples, he much desired that his songs should be known outside India and sung by other singers too. It was in order to realize this dream, of which the old poet often spoke to me, that, while he was still alive, I undertook to translate and transcribe some of his songs” (Ricordi, Paris, 1961). The gestation of the transcription of Eighteen Songs of Love and Destiny–the title attributed to this cycle of compositions–lasted for about fifty years. Indeed, these works were rarely performed by European artists due to their difficult comprehension. After undertaking comparative studies of Indian sources, manuscripts and publications by Daniélou himself, the duo Francesca Cassio/Ugo Bonessi presented for the first time the entire cycle of Eighteen Songs to celebrate the 100th anniversary of Alain Daniélou’s birth. These works were presented both in a concert and theatrical format in Bergamo (Teatro Donizetti), Zagarolo (Palazzo Rospigliosi), Artena (Palazzo Borghese), and in Rome (Teatro dei Satiri). During three tours of India and Bangladesh, the Duo performed Songs of Love and Destiny on several occasions in Delhi, Calcutta and Dhaka, invited by the Italian Diplomatic missions and the leading Cultural institutions of these two countries. These performances were widely acclaimed by scholars and admirers of the Poet. The recordings of Cassio and Bonessi were published by the Visva Bharati University, founded by Tagore himself, in collaboration with FIND, and are also mentioned in the UNESCO web site.